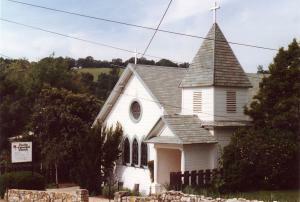 Trinity Episcopal Church began as a mission in June 1897. The Rev. W. L. Clark was assigned by Bishop Anson Graves to minister to the locale. In November 1900, the ECW provided $200 and the Diocese $100 to purchase the Amelia Street lot. Construction began the next year. The Rev. William Tuson conducted the first service in the new church on November 21, 1901. Bishop William Moreland dedicated and consecrated the church on April 13, 1902. A new parish hall was dedicated by Bishop Haden and named the "Noel Porter parish hall" in October 1963. A thrift shop was opened in 1958. Initially it was located in the parish hall, but was moved to a burned-out tailor shop and then to Main Street. After many years, it was reorganized, revitalized, and moved to Sutter Hill where it became Trinity Treasures. The period from 1958 to 1981 witnessed the installation of the stained glass windows. The first windows were created by the John Lukas Stained Glass Studio of San Francisco and purchased mostly by individual donors. The Rev. E. Frank Henriques, a former Franciscan priest, was called to Trinity in October 1975 and dutifully ministered to the growing congregation until his retirement in December 1985. During his decade of service, Trinity experienced a dramatic increase in numbers. Most significantly, Trinity Mission became Trinity Parish during the Diocesan Convention of November 1979. The Rev. William Adams came to Trinity in December 1986, and soon became noted for his dynamic scripture-based sermons and his outstanding service to the young people of the parish. He combined interests in philosophy, theology, and language with remarkable spiritual gifts. Under his leadership Trinity church achieved Jubilee status and our membership and programs blossomed. The Rev. Mark Lawrence was hired as Music Director in October 1987 and served until his death in 2004. A superb musician, he was eminently capable of taking full advantage of the church's Allen Digital Organ, installed on Ash Wednesday, 1987. He also taught music and held recitals and fund-raising concerts that brought many in from the community. 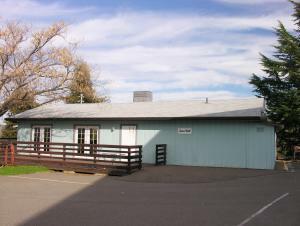 In 1987, a new two-story building was built on a lot behind the church, providing four classrooms for Sunday School and a comfortable new Parish hall. However, within the next decade it became apparent that the flourishing parish had out-grown the church building that had served the faithful for nearly a century. In January 1995, the Vestry voted to purchase the former Seventh-Day Adventist Church at 430 North High-way 49, which had been vacated by that congregation in 1992. 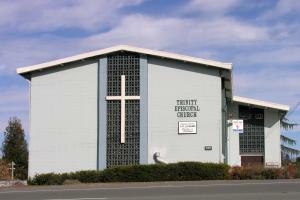 Originally constructed in 1959, the church was extensively remodeled and refurbished by members of Trinity. The stained glass windows were moved to the new church, a new sanctuary platform was constructed, and the organ was moved to the choir loft. The last Eucharist in the old church was held on May 28, 1995. The congregation met for the first time in their new church on Pentecost Sunday, June 4, 1995. It was dedicated by Bishop Jerry Lamb on July 2, 1995. The new parish hall was christened "Jane's Hall" in honor of our beloved pioneering Jane Boitano who was an important member of the first Trinity congregation. One of the church's outreach programs was one of the Interfaith Food Bank's local precursors, the Trinity Food Closet, collecting food that was brought forward at the time of the Offertory. Our programs of outreach were enhanced by the arrival of Deacon Roger Riggsby in 1990 and the ordination of Deacon Sandy Honnold in 1996. Deacon Roger was instrumental in the creation of the Interfaith Food Bank in 1996 and the subsequent erection of a large building on Sutter Hill. Deacon Sandy ministered to the older members of the parish and community. After many years of devotion and hard work, it became difficult to staff the thrift store. In recognition of the importance of our thrift store ministry to the community, Trinity Treasures was given to the Interfaith Council of Amador in January 2009 to support the Food Bank. The thrift store was renamed "Great Finds." In September 2008, Father Bill resigned , returning to former employment as a health care professional. We benefited from the leadership of The Rev. Michael Kerrick, our newly ordained associate priest until December 30, 2008. In January 2009, The Rev. Robert Blumenstock became interim rector and served for approximately one year. On Christmas Eve 2009, Canon Britt Olson became the first woman to celebrate the Eucharist at Trinity and in March 2010 The Rev. Philip Reinheimer became the interim rector. Trinity completed its calling process in September 2010 and called The Rev. Karen Siegfriedt to be the rector of Trinity. Pastor Karen celebrated with us for the first time on Nov. 7, 2010.